We’re Here in Annapolis Royal! On Monday May 5 I arrived in downtown Annapolis Royal where I was met by my new best friends Jeannie and Don Allen thanks to the introduction by Wayne Boucher. 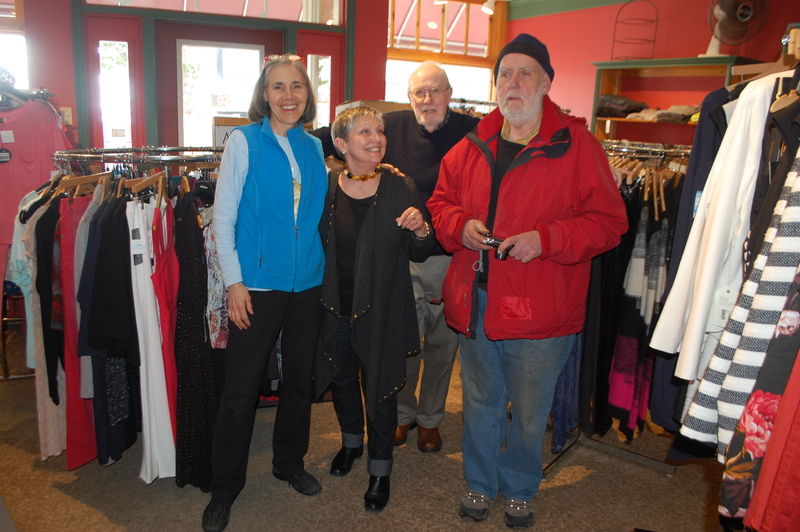 Jeannie and Don ran a beautiful little shop called Charade for over 20 years and just retired this spring. They have graciously made their building available for the Aphrodite Outlet sale and I love it. Not only that but they’re helping me work the sale along with their friend Paula. We got the truck unloaded just after noon (in the pouring rain) and got to work getting everything set up. Terry Roscoe – Wayne’s way better half came to help as well. Thanks you guys!!!! We opened on the nose at 5 pm to an enthusiastic throng of women who shopped steadily right up until closing time at 9. I heard one woman exclaim to her friend “This is better than the circus coming to town”. Today we’re there from 10 until 8 and tomorrow from 10 until 4. Then off to Yarmouth! Great! You make a âhitâ wherever you go. Glad my daughter Laura found you too. What a terrific idea, taking it on the road! !